With the big US election cycle culminating in tomorrow’s election day there has been a lot of talk about monitoring of elections. Usually I see this type of debate taking place in other parts of the world – like Zimbabwe, Kenya and Nigeria. However, this time it’s at home, and while all the focus of the world is here, it makes an interesting time and case-study for the use of technology in monitoring of everything from election fraud, to fairness and accessibility. This new generation of read/write technology using the web and mobile phones creates a situation where ordinary citizen have both awareness and opportunity to take part in an way that wasn’t possible in such great numbers only a few decades ago. There are really two components; gathering information and then distributing that information in a way that is useful for two types of users. First, the general public. Second, the officials and/or media who can cause something to happen when a bad situation arises. 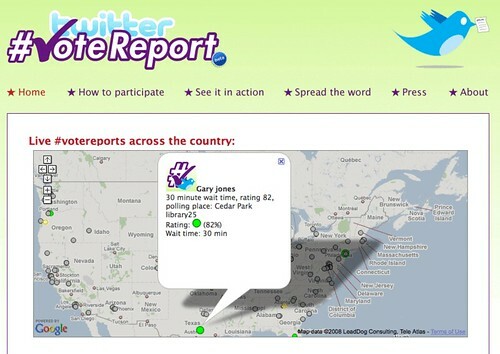 VoterSuppression.net – A wiki where users can learn about and enter in reports of voter suppression. 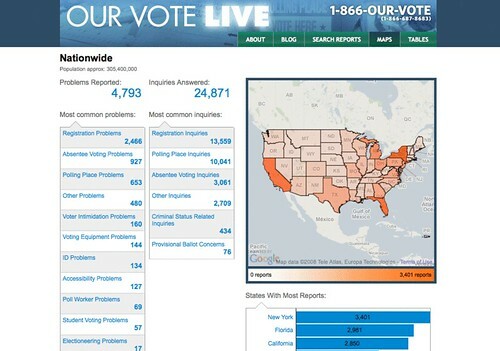 Our Vote Live – A site documenting the voter assistance work of the Election Protection Coalition that uses a phone call-in system (866-OUR-VOTE). Ethan Zuckerman is wondering whether Twitter, or even mobile phones and the web, are the right tools for monitoring an election. He brings up the fact that using old-school technology like radio and TV can be even more useful in places like Ghana, and how that differs with the experience in the USA. I think there are two things going on here. First, the cultural use of technology is changing. We’re in that strange twilight zone between mediums where the population is split between overlapping islands of web usage, mobile phones, radio, TV and print. Second, this cultural usage shift is compounded by having a two-tiered pattern of usage in different parts of the world. Ethan is absolutely right that one of the best tools in Africa is still the radio. However, that doesn’t translate to the US, where the country is too large for any one radio station to really hold sway. Many in the US tune into “national” radio personalities and shows, who have no “local” footprint. Calling in with your voting precinct’s flaws from Kooskia, Idaho wouldn’t make sense. Thus the use of the internet, and mobile phone. We’re at a point where we’re trying to raise awareness, interactivity and reach. What happens when we get mass public awareness of a tool, married with an efficient and useful way to get aggregate data in local communities? One item that isn’t up for debate is this. At this time you need to marry up the coverage and awareness power of traditional media (radio, TV and print) with the simple tools and platforms that use the web and mobile phones correctly to gather and disseminate information. What I find most encouraging is that most of the initiatives listed above are using the new tools and they are partnered with major media organizations that can muscle this out to a national audience. Also read the PBS Mediashift article covering these services in greater depth. Would be interesting to see how to monitor fraud on electronic voting machines – taken that these are the easiest to tamper with.